Confession time. I did one of the worst things a gardener could. An error that with more than ten years of dirt under my nails should simply have not occurred. I've warned others not to do it, for heaven's sake. But here I am, head hung in shame, confessing my error. I planted mint in the garden. Directly in the soil. Three times. Here's the context, a.k.a. my excuse. I'd been in Japan less than three months when the farmers told me I could have a little corner of their fields to call my own, to grow whatever I wanted. I was ecstatic beyond belief. Filled with such euphoria I went to the nursery, which is akin to going to the grocery store when you're hungry. You crave everything and anything, end up buying more than you need and a handful of things that aren't good for you. I filled two bike baskets and another bag hung from my handlebars. Mint and lemon balm sat innocent-leaved among tomatoes, nasturtiums, cosmos, marigolds, and eggplants. A year of so later a friend mentioned her husband found bergamont at another nearby nursery. Bergamont?!? My head filled with memories of summer meals at Sybil and Maan's where Maan introduced our neighborhood to a magnificent potato salad made with the leaves of this Michigan native. Food and memory are powerful forces in my garden,, and I dashed off to see what I could find. 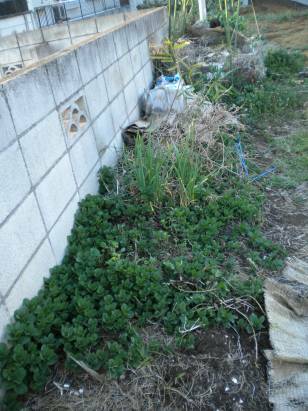 Despite knowing full well that bergamont is a member of the mint family and that it is not native to Japan, I planted it in the garden. How bad could it be? Well, let me tell you. The mint family is aggressive. I might almost call it the yakuza (Japanese mobsters) of horticulture. I do admire the determination it has to spread and grow, and I am grateful for the mini-forest it creates to shade a local stray cat, shelter salamanders and praying mantis', and the erosion control it offers. And let's not forget mojito's, salads, and tea, either, but there ends the silver-lining of this menace. Mint, as is its wont, is taking over. When I refer to the 'mint forrest' above, I'm not kidding. Both ends of my west wall bed are full of it, and one of my compost bins has been half eaten by it. It's also creeping into my lasagna bed. The stolons it sends out have snuck under (and sometimes through, damn them) my tatami mat mulch to appear next to my potato sprouts. The lavender, a favorite with butterflies and those venturing by on the walking street, is being molested by it. The bergamont nearly destroyed one of my rhubarb plants, which frankly is going too far. What I should have done if I really wanted mint in the garden would have been to turn to my trusted Rodale Ultimate Encyclopedia of Organic Gardening for guidance. There they advise to "...plant mints in bottomless containers that are at least 15 inches deep and sunk in the ground with one or two inches protruding above the soil surface, or plant above ground in tubs and barrels." Instead, I'm carefully working out the stolons and packing them into our burnable trash, giving lots of away for tea, or for potting up (with stern words of caution!). Got a garden confession to make? There's no shame in sharing these things. Heaven knows, I've got no right to judge after this doozey. Let's hear it. Most mints are annuals here in Alaska, but there is one that is hardy even with 450 below in winter. Even as I type, the little mint plant I put into my container on my patio threatens to take over...Maybe I'd better get it into its own pot NOW NOW NOW. Who knew mint was so insidious?! As I consider my own herb garden in our new backyard, I will heed your caution. Thank you! Joan, I probably would have done the same. I love all three of those herbs. I have grown lemon balm from seed this spring and plan to plant them in the vegetable garden soon. Mind you, in my gardening experience lemon balm does not spread quickly enough to become annoying. Mint is another story. I had been contemplating planting some; maybe not. For beebalm I am going to try the native Monarda fistulosa, which is not as showy but still delightful. The first wildflower I (as a teenager) ever grew from seed came from an unidentified seed head I found. It turned out to be M. fistulosa. I had never seen it before, so it came as a surprise and miracle. I was hooked on natives after that. I love it! Mint has taken over! At least it smells good, right? Good luck to you and thanks for sharing. We love growing and using fresh herbs when we cook - will be cautious with mint now! Good to meet you through the blogathon! Not that I'll be planting mint anytime soon- but it is sure good to have that knowledge IN CASE- I was ever tempted to!!! I am the least green thumbed person = my orchids are the only things I seem to be able to keep alive- they appear to just live no matter what I do or don't do. ha ha!! I continue to read your blog hoping some of your green thumbness will transfer through the screen :) ha ha!! Oh, yes, I planted one teeny-tiny 2" pot of mint in one flower bed many years ago... and it's taken over everything! A couple of summers ago, I dug out that entire flower bed 8 inches down, discarding every stolon, stem, leaf, twig, stick and stone that I found in the dirt. And the next spring, the dang mint was up and running again! I think it's time to pull out the big artillery and paint the mint with Roundup herbicide. Since it's encroached on my "fairy rose" bush, I dare not spray the Roundup, but can easily use a disposable foam paintbrush to liberally coat the invasive stuff. It's such a nice sunny spot that moss roses & portulacas would thrive there through our hot, dry Texas summers with no extra watering, so I'd like to get those cheery succulents back in that flower bed. Too bad that mint seems to thrive on neglect! Good luck in eradicating this pest. We moved into our house last summer and I've discovered 9 (yes, 9) pockets of mint in the back yard. T'will be interesting. I knew not to plant mint...but did I know not to plant oregano? No...It spreads everywhere. Next time it's going in a pot. And my latest ooops is calendula. I'm currently pulling it out inside and outside of my raised beds. Well, I had no idea this would resonate so well with so many folks! I'm taking a break from looking up mint recipes (jam, juleps, etc.) to check in here. Sue Ann, I'd like to meet that mint! Wow. It deserves a commendation for dealing with Alaska winters. Aron, thanks for checking in! You're on my list of blogs to check out, for sure! Barb, as long as it's in a container, you should be fine. It will, most likely, take over that container, and survive through for a few winters. So, be careful when disposing of the soil. Don't blithely toss it in your compost bin or just out the door. Unless you dearly love a cup of mint tea - fresh! Lisa, I'm quite excited to hear about your herb garden. Another friend over on Facebook just mentioned valerian is another trouble-maker. Perhaps read up on the invasive plant list for your area, and be careful while having fun. You should make one based on your favorite foreign books, i.e. herbs from those countries. Oh, I'm so excited for you! Jan, I'm rather jealous of your oregano and calendula. My oregano is doing well, but not going mad, thankfully. And my calendula seeds chose to take the season off, much to my sadness. I'll be trying again, as we love seeing the bright petals in our salads. Van, you are quite right about that variety. It's what I fell in love with at home (you should really try the potato salad recipe), and what motivated me to plant it here. Jennifer, do be careful, but do enjoy it, too! Ha! Love the metaphors in here ~ captivatingly written! I made the mistake of not planting my tomatoes deep enough one year ~ it was pathetic. I think I got 3 tomatoes off those plants that year. Didn't know this about mint (love it for making fresh ice cream), so will learn from your mistake and plant mine in a pot! Mikaela, You make fresh ice cream?!? That is a brilliant, brilliant idea. Any ideas how I might make a version of that here without an ice cream maker?